LITCHFIELD — A fire possibly caused by a generator destroyed a garage on Plains Road Thursday afternoon, but the blaze left the nearby house mostly unscathed. Staff photo by Andy Molloy FLAMES: Firefighters take cover from smoke and flames Wednesday while battling a fire on the Plains Road in Litchfield. 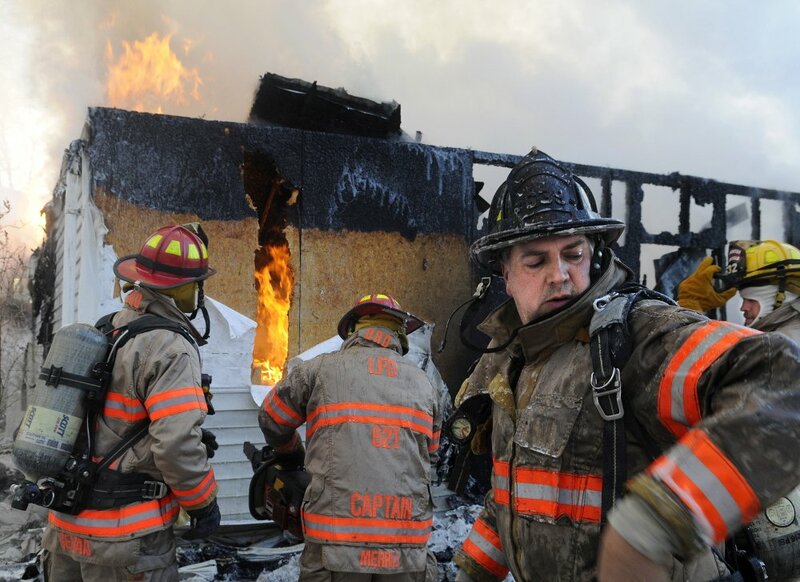 Dozens of volunteer firefighters from area communities responded to the blaze that injured one man, destroyed a garage and heavily damaged the attached home. The homeowner, a 61-year-old man, was in the house at the time and was transported to Central Maine Medical Center in Lewiston by Gardiner Fire and Rescue for an unrelated medical condition, according to Litchfield Fire Chief Stan Labbe. No one else was in the house or garage when the fire started, he said. Litchfield Fire Department receive a call for the garage fire at 629 Plains Road shortly after 3 p.m., Labbe said. Crews had the fire under control in about an hour-and-a-half, and it was cleared it by 6 p.m.
Fire departments from Bowdoin, Bowdoinham, West Gardiner and Richmond also responded, Labbe said. He said the one-story ranch house, which was connected to a breezeway a few feet from the garage, sustained damage to its siding but not the interior. Labbe said it’s possible a generator in the garage started the fire. At 2:02 p.m., a 24-year-old Chelsea man was issued a summons at Hannaford supermarket on Cony Street on a charge of theft by unauthorized taking or transfer. 5:48 p.m., a personal injury motor vehicle crash was reported near Barnes & Noble on Townsend Road. 7:03 p.m., disorderly conduct was reported on Glenridge Drive. At 1:11 p.m., harassment was reported on Federal Street. 2:40 p.m., a theft offense was reported at J&S Oil convenience store onMount Vernon Avenue. 2:52 p.m., harassment was reported at Walmart on Civic Center Drive. 7:23 p.m., disorderly conduct was reported at Walmart on Civic Center. 8:10 p.m., disorderly conduct was reported on Valley Street. 9:43 p.m., criminal trespassing was reported on Boothby Street. At 1:30 a.m., a domestic disturbance was reported on Northern Avenue. At 6 p.m., an elevator emergency was reported at Cotton Mill Apartments on Academy Street. 9:13 p.m., a missing person was reported on Academy Street. At 8:26 a.m., disorderly conduct was reported on Water Street. At 7:34 p.m., John D. Malley, 42, of Augusta was arrested on charges of domestic violence assault and obstructing report of a crime by police responding to a report of a domestic disturbance on Windy Street. At 12:26 a.m., Keith R. Casey, 34, of Augusta, was arrested at Kohl’s, Stephen King Drive, on two warrants from Augusta District Court and at the same time and location, Nicholas J. Wheelock, 33, of Gardiner, was issued a summons on a charge of theft by unauthorized taking or transfer. At 6:18 p.m., Bruce L. Collins, 47, of Gardiner, was arrested on River Avenue on a charge of operating under the influence.